This image shows the locations of the buried basins detected by the MARSIS sounding radar in July 2005. 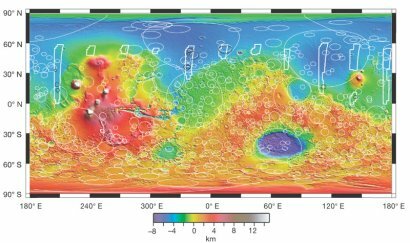 Locations and inferred diameters from MARSIS echoes are shown in black on a MOLA colour-coded shaded relief. The locations and diameters of quasi-circular topographic depressions with diameters larger than 200 kilometres are plotted in white. White polygons show the area covered by MARSIS orbits. Where there is left/right ambiguity in the location of a buried basin that coincides with a quasi-circular topographic depression, the plotted location reflects the minimum offset between the centres of the buried basin and the quasi-circular topographic depressions themselves.